1. Muckrakers: Thanks to a lot of colleagues who apply large brains and big hours to sorting out the truth from the BS in science and environmental news. The Associated Press has two of the best, Seth Borenstein and Dina Cappiello. 2. The Web: God Bless the web. Just like TV 50 years earlier, the Web makes it easier for us to be smarter. Or stupider. 3. Crazy Inventors: Note to Dean Kamen: The Segway probably didn't "change life as we know it." But inventing a water purifier for developing-world villages just might. And the annual "First" student robotics competition could help develop plenty more world-changers. 4. Park Rangers: Underpaid and underappreciated, they keep an eye on the places we go to take refuge from modern life. 5. My Favorite Refuge: Arabia Mountain, a county park about 20 miles east of Atlanta: Trails, forest, ponds, and massive, moonscape-like granite outcroppings. It's also a cheap opportunity to publish a picture of my dog, hiking said Mountain in apparent violation of the leash law (below right). 6. Historians: The hardy band of people who are trying their best to have us not repeat our mistakes. A special shout-out for the season goes to Nathaniel Philbrick, whose book "Mayflower" busts through the Thanksgiving myths we've constructed and gives a real picture of 17th-century Colonial America as a pretty hairy place. 7. Rocket Scientists: It may not exactly be brain surgery, but thanks for letting us explore beyond the bounds of Earth. 8. Bees: Thanks for pollinating our plants and flowers. Maybe we'll stop killing you off someday. 9. Politicians: Okay, it's a very limited thanks. But thanks at least for providing and funding parklands and trails. Since this is a happy blog, I'll let my other thoughts on politicians go for now. Maybe you could pay the Park Rangers something beyond a subsistence wage. 10. Science Teachers: The one that sticks out for me is the late Dr. George Marchesi, a former vaudeville magician who would work his magic act into physics lectures. Thanks, Doc, it was the only way I could have ever gotten through physics, let alone actually remember some of it. 11. Forecasters and Engineers: There are a couple of hundred dead and missing from Hurricane Ike, the worst storm to hit the U.S. this season. That's awful, but a century ago, a similar storm in a similar place killed over 6,000 in Galveston. Thanks to those who send out the warning, those who build the buildings and seawalls, and the ones who work public safety jobs. You're all lifesavers. 12. Franko, our most frequent blog commenter. Others of you have offered your own comments on Franko's haiku-like offerings, which you'll see in the "Comments" section of almost every one of the 300+ postings on the SciTechBlog since we opened for business in February. According to our fellow readers, Franko's "brilliant," "inspired," "creative," "incoherent," and "heavily medicated." I'll just leave it at "thanks, Franko." And thanks to you all. Forget about your 401 (k). Forget about that little Dow Jones number in the corner of the TV screen that almost always has a minus sign in front of it. Forget about the sudden media interest in the Great Depression and Herbert Hoover's presidency. We've got an hour's worth of good news for you. For the past year, CNN's Miles O'Brien has searched high and low for Solutions: ideas, inventions, and people that have stemmed environmental impact and in most cases, saved a little money to boot. "Green Warriors: The Fight for Solutions" airs on CNN/US at 6 p.m. ET Saturday Nov. 22, and again at 2 p.m. ET on Sunday, the 23rd. CNN's international audience can catch the show at 10 p.m. ET Saturday. We visited a guy in El Paso whose growing business is, well, growing pond scum. 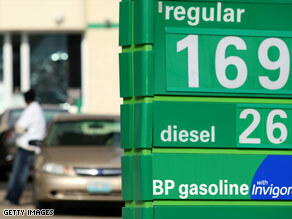 The algae can be converted into diesel fuel. Another segment profiles a wildlife officer who pretty much singlehandedly restored the bald eagle population in New York State. In other segments, you'll see old tires turned into new products, soda bottles turned into carpet, and as a result, garbage turned into money. The "Solutions" series has its own page on CNN.com here. Enjoy. Okay, that headline is the only joke in this post about turning astronaut waste into drinking water. So please get the "yuck" factor out of your system and read on. Among tons of equipment that the space shuttle Endeavour hauled to the International Space Station (ISS) is a new water-purification system that recycles everything - humidity, condensation, sweat and yes, even urine - into purified drinking water. The WRS, or water recovery system, includes two refrigerator-sized racks packed with a distiller and filters. "We use some traditional technology, such as filtration systems, but some of the technology is unique to our operation, like working without gravity," said Bob Bagdigian of the Marshall Space Flight Center in Huntsville, Alabama. 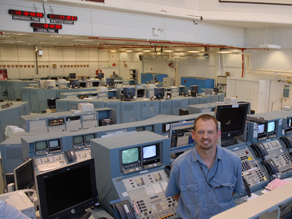 He's the project manager for NASA's Environmental Control Life Support System (ECLSS). Each crew member on the ISS uses just under a gallon of water a day. Water is needed for drinking, brushing teeth, flushing toilets, showering, and washing hands, clothes and dishes. About two thirds of that water now comes from Russian Progress resupply vehicles, the European Space Agency's Jules Verne automatic transfer vehicle, and NASA space shuttles. The remaining third comes from a small water processor on the Russian side of the station. That system captures sweat, and other water vapor in the air as it passes through the air-conditioning system, filtering it and turning it into drinkable water. With the planned doubling of the station crew from three to six, there's a need to look for more efficiency in handling supplies - especially water, that is plenty heavy and therefore plenty expensive to bring up from the ground. Any long-term outpost on the moon or Mars will have no choice but to recycle liquids. So it made sense that an early version of such a system be tested on the space station. If this system works as planned, it should cut the need for water delivery by 65 percent, producing 6,000 pounds of potable water each year. The environmental team at Marshall in Huntsville, Alabama, does more than just water purification. These microbiologists, chemists, materials, chemical, mechanical, and software engineers are part plumbers, part HVAC workers and part environmental police for the space station crew. Their systems do everything from providing oxygen and potable water to removing carbon dioxide from the cabin air and maintaining cabin temperature and humidity levels. So how sure will the station residents be that the water is fit for human consumption? They won't drink a drop until several samples have been flown back to Earth and are tested and re-tested. The purification technology design also has provided assistance on Earth. Similar equipment has been used in aid centers after earthquakes in Iraq and Pakistan, said Bagdigian. Does Bagdigian, trained as a biologist and chemical engineer, ever get tired of the bathroom humor? He laughed. Non-scientists, especially kids, can identify with such a basic human function, he said. "Everybody is interested in living in space and how that is going to become a reality." Over the years, cruise ships have been under fire for sometimes sketchy environmental practices. But it's looking like the green movement is even moving to the aqua-blue waterways. 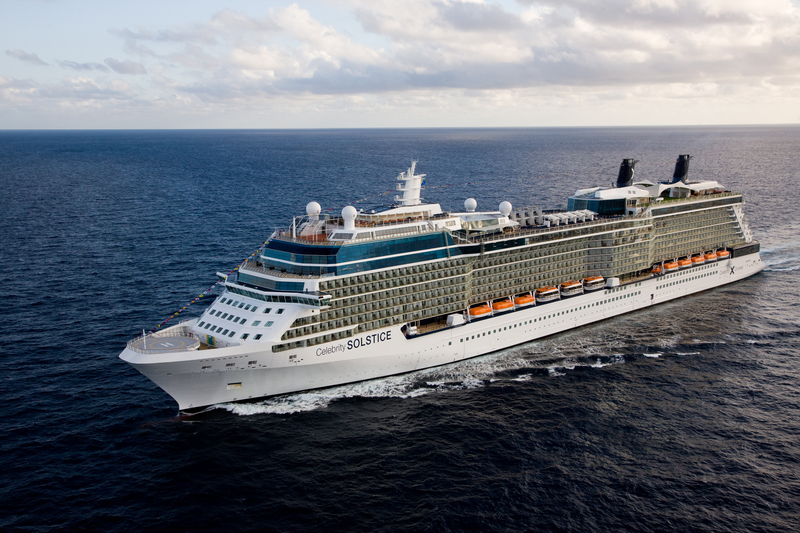 Celebrity Cruises' new ship, Solstice. I just got off the inaugural sailing of the new Celebrity Solstice cruise ship. This boat is big pimpin' - stylishly appointed with all the bells and whistles. But what may be more impressive than all the onboard comforts are the advances Celebrity has made to help protect the ocean. Save the Waves is a comprehensive environmental protection program Celebrity established 20 years ago. You might say its just PR greenwashing, but some steps they take to be green are pretty dramatic. For instance, recycling bins for aluminum, plastic, and glass containers are a breeding ground for bacteria. The only way to prevent the bacteria from growing is to cool the containers, so they store recyclables in a massive refrigerator. On the alternative energy front the Solstice is the first cruise ship to utilize the sun with solar panels spread out around the ship. They don’t generate a ton of juice but every little bit helps, as do the 25,000 LED light bulbs used onboard. Oh, and the ship also has a seaworthy lawn with real grass. Its more of a novelty than an environmental initiative, but it does bring a literal accent to a ship that's trying - and succeeding - to be a little greener. Endeavour launch countdown is "Blog Heaven"
Dozens of bloggers kept their thoughts flowing during the countdown to the launch of Endeavour on Friday. Only one person did it from Firing Room 3 of the Launch Control Center at the Kennedy Space Center. “It’s a great environment. The only better seat would be on the shuttle itself,” said Steve Siceloff, public affairs web writer at KSC. Bloggers around the world got much of their countdown information from Launch Commentator Candrea Thomas on NASA TV. Siceloff had a lot more raw information to process. “I’m listening to eight different audio loops. That takes some training of its own,” he said. The rocket scientists talking on all those other channels are monitoring the orbiter, three main engines, an external fuel tank, two solid rocket boosters, and oh, a couple million other parts. So what’s the atmosphere in the firing room? “It’s actually very calm. Everybody’s into their books and into their own world. They’ve all got headsets on so they don’t talk loudly,” he said. Siceloff, who says he’s been a space geek since he was a kid, used to cover NASA for the Fort Pierce Tribune and Florida Today. He’s been blogging, writing and producing for the NASA web pages for a year and a half. Endeavour’s launch blog got underway at 2:30pm. For the most part, it was a very quiet countdown. “The launch team is working no technical issues” was a very common refrain on NASA TV. But about 15 minutes before the scheduled 7:55pm eastern launch, we “civilians” in the NASA press room suddenly displayed the loud, rough, somewhat chaotic personality of most newsrooms. There were a few words on NASA TV about a technical issue. Something about a door not being latched. After miles of checklists and a near flawless countdown, could an open door stop this launch? 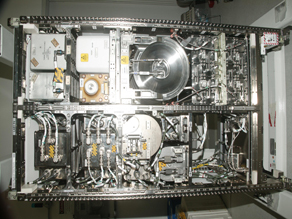 7:40 p.m. – Launch controllers are discussing a potential issue with a door in the White Room. There is concern whether the door has been pinned back. The door in question is not on Endeavour. While scores of us in the press room were on the phone with our editors with a “Danger Will Robinson… this COULD be a showstopper” tone in our voices, Siceloff said the scene was far more serene in the Firing Room. 7:46 p.m. – T-9 minutes and counting . . . Launch controllers have cleared the door issue, saying it does not pose a hazard to Endeavour as it climbs away from the launch pad. All launch teams are go for launch. So do rocket scientists ever get excited? “When the shuttle clears the tower, there’s a whole lot of clapping,” said Siceloff. And yes, said Siceloff, the stuff they say about rocket scientists is true. “They really are the smartest people in the world,” he said. Will "Change" hit the space program? As the shuttle Endeavour pursues its expansion and re-supply mission to the International Space Station, the political world still turns nearly 200 miles below. Will a President Barack Obama and a fractured economy spell change for NASA and space exploration? 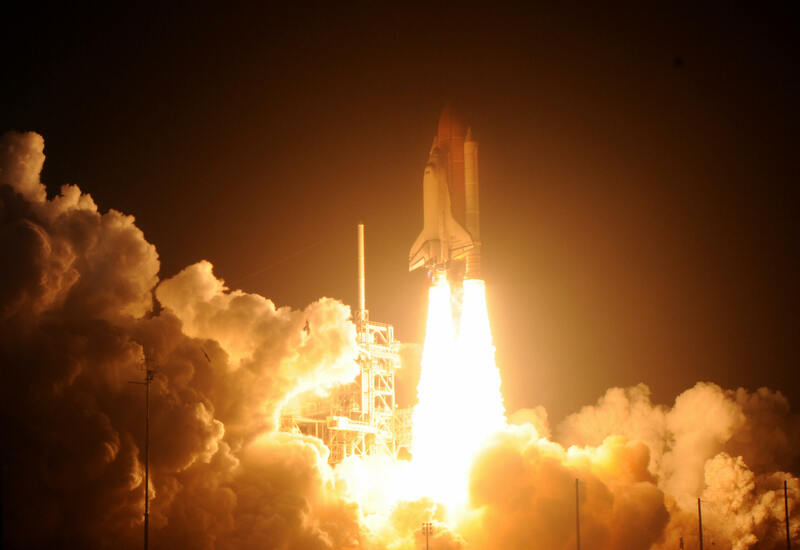 The space shuttle Endeavour blasts off successfully Friday night. The agency's $17 billion annual budget - about a third of which goes to fund the shuttle and other space missions - may be under scrutiny, along with everything else, in our new financial climate. On the campaign trail this year, Obama said, "We cannot cede our leadership in space. That's why I'm going to close the gap, ensure our space program doesn't suffer when the shuttle goes out of service." But skeptics raise multiple questions, starting with the fact that the president-elect made that statement in the heat of a tight campaign and in NASA's Florida backyard. It wouldn't be the first time that a president abandoned a lofty promise to reach for the stars. In his 2004 State of the Union speech, President Bush announced an ambitious effort for manned missions to the Moon and Mars. But the money never came through, and it's rarely been mentioned since. With the shuttle slated for retirement in 2010, how long will it take to get the replacement vehicle ready? Many think the 2015 deadline for the Orion craft and its Ares rocket is too rosy. Can we afford it? NASA's budget is only about two-thirds of one percent of the Federal budget, but is it high enough on our national priority list? And just what are we getting back for our dollars? Is the science we're getting from the Shuttle and the ISS going to pay for itself? Proponents say it would be shortsighted to ditch our science and exploration efforts because America can't afford to fall farther behind in tech and science literacy. To be sure, NASA's had its triumphs and tribulations in recent years. On the down side, there's been uncertainty over the shuttle, the Columbia disaster, a couple of failed Mars missions, the earth-bound controversy over political censorship of the agency's climate scientists and NASA's first successful launch into the tabloid world with last year's bizarre astronaut love-triangle story. NASA's victories, however, are unmistakable: The Hubble Space Telescope has led what's now routinely called "The Golden Age of Astronomy;" the Mars Rovers' unexpected five years of service; and groundbreaking research in space, on land, and in the oceans. So let's hear from you: What should the Obama Administration do? Has NASA earned our continued support? Does the mission need to be corrected? Or should we put the money elsewhere? Watch CNN's Situation Room Monday at 5 p.m. ET for a report from Miles O'Brien on Obama and the future of space policy. And you can read the Obama campaign's space policy here. With the weather the only question mark at this time, the seven-member crew of Space Shuttle Endeavour will suit up and close the hatch in the 5 p.m. ET hour today, hoping that a cold front with potential cloud cover and crosswinds will permit the launch at 7:55 ET this evening. It's only the third nighttime launch since the Shuttle Columbia disaster five years ago. NASA mission managers were reluctant to launch after dark, when it would be harder to spot the kind of launch damage that eventually doomed the seven-member Columbia crew. A piece of insulating foam separated from Columbia's fuel tank, piercing the shuttle's leading wing edge and compromising its protection from the intense heat of re-entering the atmosphere. CNN's Miles O'Brien will broadcast live from Kennedy Space Center for the launch; he'll be accompanied by Janice Voss, a veteran of five previous shuttle missions. Should the launch be scrubbed for weather or technical reasons, there are other launch opportunities Saturday at 7:25 p.m., and Sunday at 7:02 p.m., though Saturday's weather looks dicey as well. Endeavour will carry a module to add to the ISS, expanding sleeping quarters and adding toilet facilities with a goal of expanding the station's capacity to host up to six long-term occupants. Weather for Friday's shuttle launch: "70% go"
The 45th Weather Squadron from Patrick Air Force Base is predicting a 30% chance that weather will delay the Shuttle launch scheduled at Kennedy Space Center for 7:55 EST Friday evening. The astronauts on the STS-126 mission will transport equipment to expand the International Space Station to accomodate a crew of six. According to NASA’s Oct. 1 press release, "Endeavour will carry a reusable logistics that will hold supplies and equipment, including additional crew quarters, a second treadmill, equipment for the regenerative life support system and spare hardware." However, the concerns for Friday are thick clouds and possible rain showers within 20 miles. If the launch is delayed, the conditions are only expected to get worse. The 45th Squadron expects a 70% probability of scrubbing a Saturday launch. Should the launch be delayed twice, Sunday's improving forecast lowers the postponement probability to 20%. NASA also monitors weather conditions at the primary emergency landing sites. Conditions are good at California's Edwards Air Force Base and the White Sands Missile Range site in New Mexico. Two of the three Transatlantic landing sites - the Istres Air Base in France, and Zaragoza in Spain, may have marginal conditions should they be needed for an emergency landing - something that's never happened in the history of the Shuttle program. Miles O'Brien will cover the launch live Friday night at 7:55pm on CNN and CNN International. Your wireless internet connection is secure, you have anti-virus software, and your firewall is up. You think you are safe from identity theft but there is a new way to gather information from your computer. An internet connection is not even needed. This time the culprit is your keyboard. With each keystroke a slight electromagnetic wave is emitted. A simple wire cable or a small antenna can pick up these waves. With the right computer software keystrokes are deciphered. These waves can even travel through walls. 11 different PS/2, USB and laptop keyboards were tested by Sylvain Pasini and Martin Vuagnoux. They are doctorate students at the Security and Cryptography Laboratory at the Ecole Polytechnique Fédérale de Lausanne in Switzerland. For their experiment they attached a keyboard to a laptop that was running off of battery power. They unplugged the laptop to prevent electrical interference. Each one of the keyboards tested was vulnerable to at least one of the four detection methods that Sylvain and Martin have discovered. So far they have been able to detect keystrokes up to 65 feet away. They believe a farther distance can be achieved by using better equipment. Both Pasini and Vuagnoux blame computer manufacturers for this vulnerability. However, the security risk could be lowered by tweaking the production of keyboards. Do you feel that this could be a legitimate threat as ATM pads are even vulnerable according to Pasini and Vuagnoux?